~What is your unique seed? Your precious offering to the world? ~How are you navigating in your dreams? Join us for a fully interactive, participatory workshop to focus, explore, free more and empower ...your potential! This is a co-creative event inviting your talents, gifts, dreams, intentions and questions and offering inspiration, connection and support in order to step up and move forward. It is an invitation for young and more experienced women entrepreneurs, artists, creative minds and hearts, local and international living in Rhodes and seeking for connection, inspiration and support. Please note that this workshop is addressing women but it does not exclude men from joining us and offering their contribution to the Cafe. In the cosy and stylish, warm atmosphere of ONO Bar, a creative ground and "seed" in its own right, we are going to work pleasantly & productively as a "parea" ("παρέα¨) revisiting dreams and projects, touching upon and re-appreciating skills and talents in a participatory and highly effective process. This is the first of two Synergy's Women Entrepreneurs Days in the form of an Open Cafe at Ono Bar and English will be our working language. The next workshop will be held in another public space in town in Greek as the working language and in a similar style. Join us for a joyful full of creativity cafe session and get inspiration and valuable support for your projects and ...seeds! 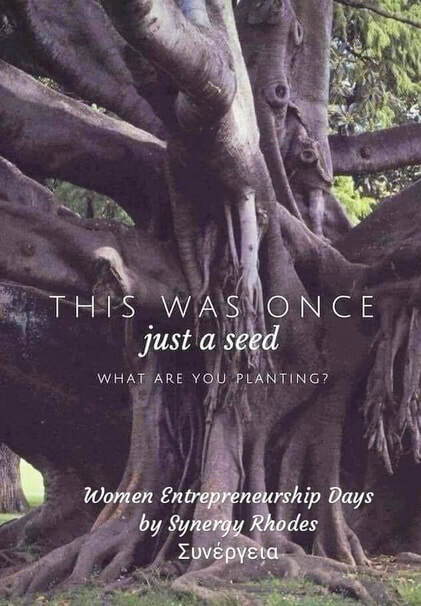 This is an event celebrating women's creative, entrepreneurial potential, skills and dreams! When you register, you are wholeheartedly invited to bring along something (an object, a creative piece or an image) that represents your unique passion, gifts and talents. And as we are co-creating this experience together, you are very welcome to bring anything to contribute to this "parea" atmosphere of sharing and mutual support. The detailed flow of the workshop will be provided upon registration. The principle of this cafe is "offer as much as you can and a little bit more for those who can offer less"... So in any case please don't let money to be an obstacle for you joining when you really want to! Contact us and we will find a way. There will be a box/community pot for money contributions. You are also very welcome to offer the gifts of your skills, talents and generocity and by this to beautifully contribute to the gathering and its essence during the cafe. See you at ONO Cafe Bar, Amarantou & 28th of October street (near Academia Square) Find Map & Directions here.